Iraqi Post features the most famous monument of the country on a stamp issued on on 28th February 2008. The Baghdad Clock or Baghdad Tower is a public building located near the Green Zone, in Baghdad, Iraq. The building was employed as a museum and featured a large clock tower. The Building is considered as the signature monument of the city. 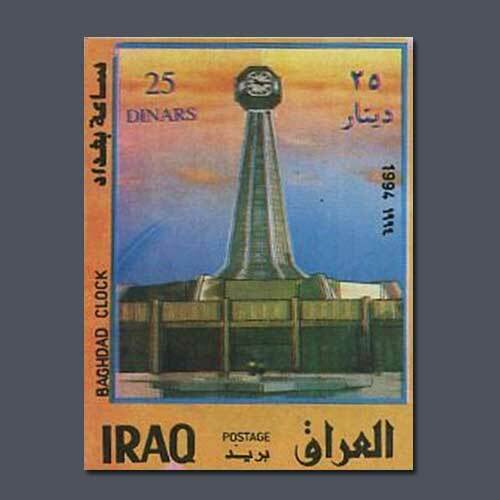 A stamp of 25 Iraqi dinars was issued as a part of a set issued to commemorate the monuments of the country. The stamp features a photograph of monument in the centre flanked by the denomination in roman on the right and in Persian on the left. The name of the country is mentioned at the bottom similarly as the denomination. This signature monument of the city was heavily damaged during the 2003 invasion of Iraq and was reconstructed to become the seat of the Supreme Court of Iraq. The stamp was in the memory of the old monument.